One of the benefits of being a member of a local club is that they usually have access to some form of dark site for viewing (or imaging) away from the light dome of the city. These are no different. The HAAS dark site to the north is closer (Huntsville) at about 52 miles one way while the HAS dark site is west of me (Columbus) and over 100 miles one way! This really impacts the time you have to be productive when you take into account the time it takes to set all the gear up, polar align the mount, and do a star alignment. All the targets I’ve worked on thusfar (all three… woohoo) have been imaged at the HAAS observatory location, but after a month of inaction, I had a chance to image at the HAS site. I had some trouble with star alignment that delayed data acquisition. The moon was bright and clouds were starting to roll in by the time I actually worked out the alignment. It wasn’t optimal by any means, but at least there were a few frames to be had… 26 lights and 30 darks totaling about 2.6 hours of total integration (give or take). 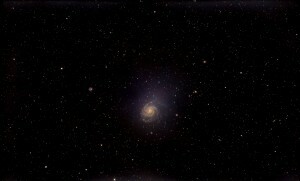 My first attempt at Messier 101, the Pinwheel Galaxy, in wide field. Note NGC5485, NGC5474, NGC5473, NGC5457, NGC5443, and NGC5422 are also visible in this frame. Noise was a real issue here… as it has been in almost every integration. I’m learning tips and tricks along the way, but this gain noise due to sensor heat (CMOS) in my DSLR is going to have to be dealt with at some point. Previous PostSome New InSight.Next PostLet there be dark!